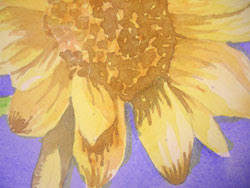 I have also begun to use a stronger, but still very wet, wash of Burnt Sienna to the details of the sunflower head. It's important at this stage, to pay close attention to the direction of the light. I want to paint darker values and the shadow areas to create the illusion of shape. As I work the brown pigments over the dried blue glaze, the blue disappears, yet adds value to the brown washes.